The steps you'll need to follow to enrol are different depending on what type of student you are. Local students are Australian or New Zealand citizens, or Permanent Residents of Australia. International students are any students who are not Australian or New Zealand citizens, or Permanent Residents of Australia. Non-award students are only enrolling in specific units that are not part of an overall course. Higher degree research (HDR) students are enrolling in a masters, honours, PhD or professional doctorate course. 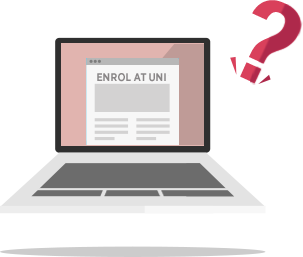 Western Sydney University Online - you're an Online student if you're enrolling in one of the advertised online courses. To accept your True Reward offer, you need to complete Step 3 of the enrolment process in MySR (Government Forms) before the offer expires on 21 December 2018 at 5pm. To enrol, you need to activate your student account (called your 'WesternAccount'). This account gives you access to all our online services (including My Student Records (MySR) – your online student record, the Library, your student email account and more). You'll need your Western Student ID number (which we emailed to you together with your offer). If you're having problems finding this, please call our course information line 1300 668 370 or email studentcentral@westernsydney.edu.au. You'll need to provide your UAC number or direct Western application number and the name of the course you've been offered and confirm your full name and date of birth. Email is the official communication channel at Western Sydney University. We send important information about your enrolment, exams, results etc to your student email account, not by post, so it's important that you check it regularly - every day if you can and at least twice a week. For most courses, you may be able to defer your offer and start at a later date. Refer to how to defer your offer for more information. Find your course on the Unit Selection Guide (opens in a new window) and choose your units. Your course may have a mixture of compulsory or core units that you have to enrol in, as well as optional units (elective units). Not sure what it all means? Contact Student Central on 1300 668 370 or email studentcentral@westernsydney.edu.au. Once you've chosen your units, don't forget to check your timetable to make sure you don't have any clashes. You won't be given or sent a hard copy timetable, so it's your responsibility to check the timetable information to work out where and when units are offered and print your own copy from the system. Can I apply for credit for previous studies? If you've studied before you may be eligible to apply for credit for previous study. If you are granted credit, this may reduce how many units you need to do. There are two types of credit for previous study that is recognised at Western Sydney University. Pathways credit – if you have completed a Diploma or Advanced Diploma that is listed as an approved VET Pathway, you may be eligible to claim Pathways credit. Find out if you're in a VET Pathway and claim your pathways credit online. Advanced Standing – if you have completed any previous study (Diploma, Advanced Diploma or Degree level), you may be eligible for Advanced Standing. Find out more about Advanced Standing and how to apply on the Advanced Standing webpage. For information about your course, including advice on which units to choose, please contact your academic course advisor or the director of your academic program for help. You'll find their details under your course in the Unit Selection Guide. They're here to help you. Ready to enrol? Login to My Student Records (MySR) and let's get started. You can get face to face support with your enrolment during Orientation (opens in a new window). Enrolment help is available at Student Central. You can drop into any of our Student Central offices, call us on 1300 668 370, or email us at studentcentral@westernsydney.edu.au. Once you've enrolled, you'll also need to register for tutorials. This is a separate online process. For each unit you've enrolled in, you'll need to register your preferred tutorial times. When preferences open, login to Allocate+ (online tutorial registration) and you'll see the list of units that you've enrolled in. For each lecture, tutorial or practical class, you'll need to nominate times in order of preference. Some sessions run only once, so you won't have a choice of time. We'll do our best to match your preferred tutorial times, but it's not always possible to give every student their top preferences. Timetabling is a complex process! Once you've accepted your offer, you can pick up your student ID card from any Student Central office. You'll need to bring your student ID number with you, as well as a current driver's licence, passport or other photo identification. We'll let you know when your timetable has been completed. You can then go to Allocate+ and download this to your personal calendar. If you've enrolled in any session other than Autumn or Spring, you MUST check your census dates. Your statement of account (eSOA) is your record of what units you've enrolled in, what fees you owe and the payment options you have nominated. You can access this in My Student Records (MySR). If you're an Australian citizen and you've chosen to defer your tuition payments, this will be recorded in your statement of account (eSOA). You can check this in My Student Records (MySR). Now that you've completed the enrolment process, you can focus on preparing for uni. The best thing to do now is explore the rest of the Starting at Western Sydney University site. It's got information about Orientation, how uni works, and a tonne of great tips and tools to help you prepare and get off to a great start at Western. The first thing you'll need to do is accept your offer and pay your fees via your online student application record. Payment instructions are explained in your Offer of Admission letter. Once your forms and payment have been received, the University will send you an electronic Confirmation of Enrolment (eCoE). You can now use your eCoE to apply for your student visa at the Australian Embassy or Diplomatic Post stated on your eCoE. You can accept your conditional offer, following the steps above. If you're thinking about deferring your offer, please submit your query via your online student application record. If you've accepted your offer and received your confirmation of enrolment (eCOE), the next step is to activate your student account ("Western Account"). This will give you access to all our online services, including your student email account, My Student Records (MySR), the library and more. You'll need your Western Student ID number. You can find this number on your Offer of Admission letter. Find your course on the Unit Selection Guide (opens in a new window) and choose your units. You course may have a mixture of compulsory or core units that you have to enrol in, as well as optional units (elective units). Not sure what it all means? Contact Student Central on 1300 668 370 or email studentcentral@westernsydney.edu.au. Special Requirements – some courses and units have Special Requirements. You will need to supply documentation to prove you meet those requirements (e.g. 'Working with Children Check', 'National Police Check' or 'First Aid Certificate'). Check the course and unit information in the Handbook to see if you have any Special Requirements. Note: You can choose and enrol in units for both Autumn and Spring Sessions at the start of the year. You can change your Spring Session units after your Autumn results come out if you need or want to. Pathways credit – if you have completed a Diploma or Advanced Diploma that is listed as an approved VET Pathway, you may be eligible to claim Pathways credit. Find out if you're in a VET Pathway and claim your credit online. If your offer included Advanced Standing, you still need to follow the normal application process. If you need help, please contact Student Central at studentcentral@westernsydney.edu.au. You can get face to face with your enrolment during International Orientation (opens in a new window). You can also get help at Student Central. You can call us on 1300 668 370, email us at studentcentral@westernsydney.edu.au – just remember to use your student email account to do this – or drop into any of our Student Central offices. Once you've enrolled correctly in MySR (My Student Records), you can apply online or at Student Central for a student ID card using your Western Account (student ID and password). You'll need to bring photo identification (current driver's licence, passport or other photo identification with your name and date of birth) when collecting your student ID card on campus. Once you've been allocated to one of your preferred tutorial times, you will receive an email notifying you that your timetable is ready. You then need to log in to Tutorial Registration (Allocate+) (opens in a new window) and download your timetable to your personal calendar. The first thing you need to do is activate your student account (called your 'WesternAccount'). This account gives you access to all our online services (including My Student Records (MySR) – your online student record, the Library, your student email account and more)! You will need your Student ID number. Find your course on the Handbook (the course and unit search) and choose your units. You course may have a mixture of compulsory or core units that you have to enrol in, as well as optional units (elective units). Not sure what it all means? Take a look at the How to: Use the Handbook page. There are two types of credit for previous study at Western Sydney University. For information about your course, including advice on which units to choose, please contact your academic course advisor or the director of your academic program for help. You'll find their details on the course page in the Handbook. They're here to help you. You can get face to face support with your enrolment during the scheduled course information sessions. Enrolment help is available at Student Central. You can drop into any of our Student Central offices, call our Infoline on 1300 668 370, or email us at studentcentral@westernsydney.edu.au. All fees are due by the session census date (31 March for Autumn Session and 31 August for Spring Session). If you're enrolling in a session other than Autumn or Spring, please see the census dates webpage. You can access your electronic Statement of Account (eSOA) in MySR once the teaching session starts. It will show what units you're enrolled in, what fees you owe and list payment options. You must pay your fees in full by the census date. The total you owe and payment options are listed on your eSOA. International student? You must provide a local address as per the requirement of your student visa. Next, you need to complete the four online forms in MySR. Now click on 'Unit Selection'. When you've successfully confirmed your enrolment, an enrolment receipt will be displayed. Make sure you save or print a copy for your records. Your enrolment is complete – please remember to logout. *This only relates to candidates who have been awarded a stipend scholarship. You should now contact your supervisory panel to make arrangements to being with your research. Information, including contact details, is on your Record of Candidature, sent with your Letter of Offer. To accept your offer, you need to activate your student account (called your 'WesternAccount'). This account gives you access to all our online services (including My Student Records (MySR) – your online student record, the Library, your student email account and more). You will need your Western Student ID number. Your Student ID was email to you from Western Sydney University on the day you received your offer or the next business day. day if you can and at least twice a week. If you've received an offer to a Western course you can potentially defer your enrolment for 12 months, depending on the commencement date of your offer. Find your course on the Handbook (course and unit search) and choose your units. Your course may have a mixture of compulsory or core units that you have to enrol in, as well as optional units (elective units). Not sure what it all means? Take a look at the How to: Use the Handbook page. A list of units that are available for study through Western Sydney University Online is available on the Online units page. Note: you can choose to enrol in units for each teaching sessions at the start of the year. First year units are not available for credit for previous study at the moment. There are two ways you can go to get guidance on which units to enrol in. If you are enrolled in a Western Sydney University Online course, you do not need to register for tutorials. Once you have enrolled correctly in MySR, you will need to apply for your student ID card. Complete and submit the External student ID card application form (opens in a new window). Australian citizens – if you've successfully supplied your Tax File Number (TFN) your eSOA will say this and you don't have to take any action – your fees (student contribution) will automatically be deferred via a HECS-HELP loan. However, you can choose to pay part or all of your student contribution up front before census and receive a 10% discount. Australian permanent residents and New Zealand citizens – you must pay your fees (student contribution) up front by the census date. The total you owe and payment options are listed on your eSOA. International students (Student Visa Holders) – you must pay your fees in full by the census date. The total you owe and payment options are listed on your eSOA. Tutorial Registration (Allocate+) is an easy process. Because it’s based on the preferred class times you select, you’re more likely to get a time that works for your schedule. Preference selection is open for an extended period, so that means you can take your time to plan your timetable.